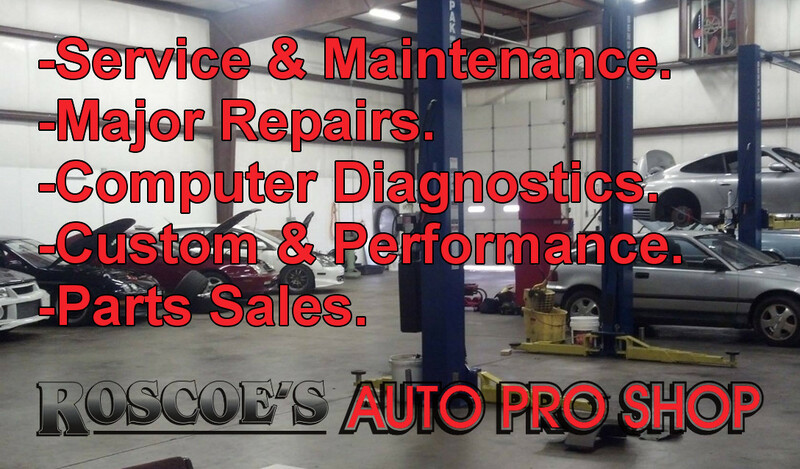 Roscoe's Auto Pro Shop - Auto Repair Performance and More. We combine Mom & Pop service with a Dealer quality Facility. Auto & Medium Duty Truck Maintenance & Repair. Richmond VA's Best Kept Auto Repair Secret. Roscoe's Auto Pro Shop offers high quality repair services done quick and at a fair price. Our specialty is large automotive repair jobs such as installing a new timing belt, replacing a blown head gasket, or even more significant jobs such as transmission repair or engine replacement. Our mechanics can do it all. Many of our customers are dealerships and business that do much of their own regular auto service but turn to our auto repair shop when major repairs are needed. However regular repairs and maintenance are done here every day for businesses and individuals alike. Our mechanics replace worn out brakes, new ball joints go in, oil changes happen, coolant flushes are done, and the list goes on. It's just this sort of work that keeps you vehicle out of the shop and on the road longer! We have expanded our car mechanic services to include State Inspection, Computer diagnostics, Medium duty truck repair, Diesel engine repair and much more. We also sell stock replacement parts both new & used for all makes and models. Our truck and car repair services are not limited to what you see here, We will perform most any job in around or under a car. Next time you need an auto shop give us a call. Auto Repair Service We can help you with anything from basic maintenance to major repairs. Call Roscoe's Auto Pro Shop. If you are looking to increase your vehicles performance let us be your first call. Most of the folks that work here are performance enthusiasts and are no stranger to the race track and drag strip. We can perform all manners of upgrades. We can upgrade fuel injection, carburetors or other fuel system components. Looking to go a little deeper into the engine such as a camshaft upgrade or head swap? Our guys and gals can get this done for you too. If its slowing those ponies back down we are happy to install performance brake upgrades. If its more speed thru the curves you are after check out the coil over suspension systems we can install on your vehicle from Fortune Auto.